Tony’s not quite finished hanging all the framed prints, and in fact there is not even room for them all, but it’s enough already to feel a not-so-subtle change of energy here at Listen & Be Heard Poetry Café. The opening reception for the new exhibition is this Saturday, September 29 from 7-9pm, and it’s free for all to attend. We are featuring prints of fine art and caricatures by Cleven “Goodie” Goudeau. When you arrive you will probably recognize the faces of many of the caricatures, priced for you to walk away with, without putting too much of a dent in your wallet. As soon as you take one off the wall, there are more faces to take those places. All the prints are priced between $35 and $75, depending on the size. All the caricatures in the show are of people who have stepped on to the Listen & Be Heard Poetry Café stage in the last few years since we opened, including musicians James Dotts and Donna Plummer, who will play for the reception. Gabi Wilson, Raymond Victor & Diane Dutra, Muziki Roberson, and members of the Talons are also in the exhibition. The Talons will take over the stage from 9pm-Midnight the same night. Anyone who spends at least $75 on prints that night will not have to pay the $10 cover charge to stay after 9pm. Listen & Be Heard columnist David Koven, poets Eileen Hidalgo and Q.R. 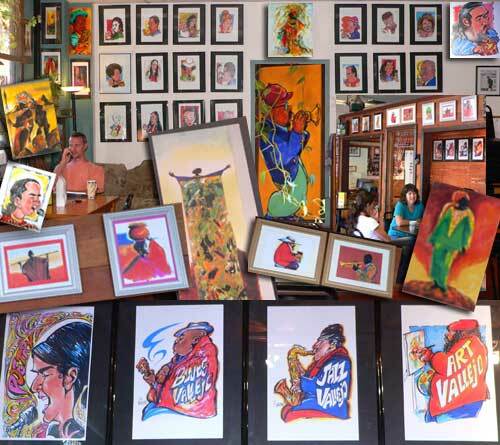 Hand jr., Simone and others, jam session hosts Ed Rivers, Karese Young, Herb Ruffin and Dennis Ocampo, and many more characters are all hanginig on the walls. I have to say, on a personal note, that the one of me makes look about 20 years younger; I’m not complaining. I’m gonna buy it. Come and see for yourself; maybe you’ll see yourself or want to buy one of a friend of yours, or your favorite entertainer. Included in the exhibition are prints of some of Goodie’s African themed paintings, also priced for you take home, or to your place of business and hang on the walls. Some are impressionistic, others in bold colors and lines. There are a few which could be grouped together to make a beautiful display on a prominent wall. They will all bring color, vibrancy and life to where you spend your time. If you’ve been waiting for a great event to visit the café for the first time, this would be it. Not only will you be treated to live music and great art. You will also have a chance to mingle with people in your community, make new and lasting connections, and most importantly enjoy yourself where you can be yourself.